The 4th of July is one of our nation’s most popular, since we gather together with family and friends to celebrate our great country. Dentists in Southwest Portland, OR Dr. Todd Beck and Dr. Jacob Morrow encourage their patients at South Waterfront Dental to have a safe and happy Fourth of July celebration. Here are a few tips to keep in mind to maintain good dental health during this (and any other) festive holiday! 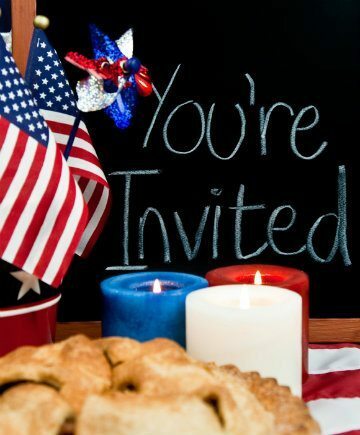 Our July 4th parties with family and friends include a wide range of different foods, many that are high in fat and calories but low in nutrition. Foods with empty calories – like potato chips, ice cream, sodas and full-calorie beers – cause insulin in our bodies to spike and promotes the storage of fat without really providing any nutrition. Much, if not all, of this food is highly processed with refined sugar and flour and are also bad for our teeth. To avoid empty calories, choose foods that are more wholesome, like whole wheat hamburger buns, lean chicken instead of beef, salad instead of chips and fruit-based desserts. This is a good strategy for staying in shape and keeping a healthy smile no matter the time of year. When you’re at a party, watch portion sizes as they can quickly get out of control. Split a steak or a burger with a spouse or friend, and limit the amount of processed foods you eat. Load up half of your plate with vegetables and fruit, or use a smaller plate to help control portion sizes. Take even more control over what you eat at a July 4th barbecue by bringing at least one wholesome dish that you really enjoy. This could be a gluten-free dessert that doesn’t have a lot of sugar but is heavy on high-fiber fruit, or a vegetable dish that’s full of flavor. Whatever dish you decide to share, make sure it’s one that satisfies your hunger without indulging in those empty calories. Moving is one way to burn calories while you’re at a barbecue or party. If there’s music, take the opportunity to dance. Encourage other people at the barbecue to play games with you, like relay races or lawn games to add some fun to the party. There will also be plenty of people to visit with during the celebration, so stroll around and keep some distance between you and the table of food to help avoid temptation. Once the July 4th celebrations are over, it might be time to come in to make sure your smile is as healthy as possible. Schedule your appointment with Portland dentists Dr. Todd Beck and Dr. Jacob Morrow at South Waterfront Dental by calling 503-841-5658! ← The Dentist Can Help Prepare for Race Day!